Health as a possibility? We live in a world where we spend a tremendous amount of energy efforting to ‘get’ healthy. Or simply working to get or obtain health. What are you striving for? 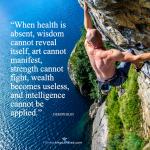 What is Health for you? What does health even mean? There are so many versions of what health or being healthy is. How would you even know if you were healthy or not healthy? These are all questions asked; to not get an answer but, to open up more questions in which creates more possibilities of what it means to be healthy.